Image: Satiric poster by an unknown author of the planned opera to be produce in a joint cooperation between La Fenice theatre and Emir Kusturica, under the support of Milorad Dodik and Republika Srpska. 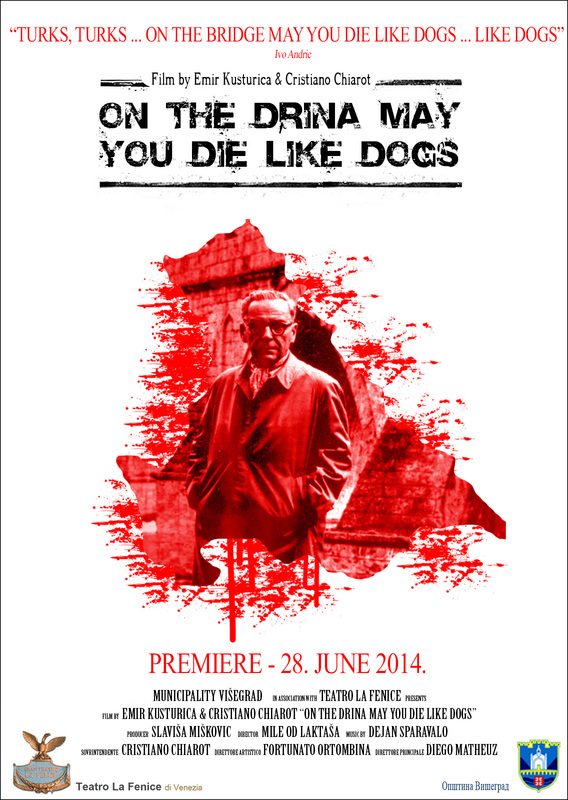 Association Cuprija, the “Stop genocide denial” movement and several other non-governmental organizations have started a campaign against the decision of La Fenice theatre to jointly produce an opera entitled “The Bridge over the River Drina” based on the novel by Ivo Andric. Image: Superintendent of La Fenice Theatre Cristiano Chiarot, Emir Kusturica and Milorad Dodik. On 26 March 2013, the director of the La Fenice – Verdiana Theatre of Venice, Christian Chiarotto, signed a letter of intent for co-producing “The Bridge on the Drina River” opera in cooperation with Emir Kusturica. The opera is due to be played on 28 June 2014 in the newly built Andricgrad in Visegrad. 28 June marks St. Vitus Day in Serb Orthodox tradition marking the anniversary of the Kosovo battle in 1389. Cooperating with Emir Kusturica and Andricgrad under the blessing of RS President Milorad Dodik. Both figures are genocide deniers and have a record of criminal records. Andricgrad was built by Emir Kusturica and Republika Srpska partially on Bosniak land without the knowledge and approval of its rightful owners. 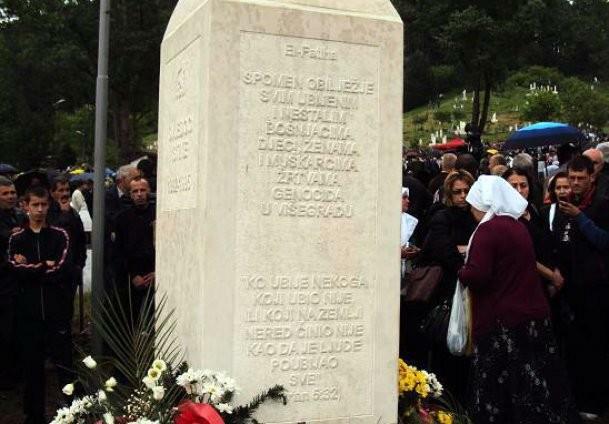 The Visegrad Municipality has been terrorizing Bosniak returnees and denying Visegrad Bosniaks the right to build memorials for theirs victims. The latest case has been the Visegrad Municipality order to remove the genocide memorial at Straziste cemetery commemorating the victims of 1941-45 and 1992-95. Serb authorities in Visegrad have still not released the locations of mass graves where the estimated 600 missing Bosniaks from Visegrad are believed to be buried. All the mosques and other Islamic heritage in Visegrad were destroyed by Serb authorities. This heritage has been partially reconstructed by the Islamic Community without any help from the Serb authorities in Visegrad. Italian troops in World War Two have left a negative image of Italy and Italians among the Bosniak population due to their cooperation with the Serb fascist Chetnik forces. The Italian troops acted identically as to the Dutch UN in Srebrenica – in October 1943, the Italian troops surrendered the Visegrad enclave to the Chetniks and watched passively as thousands were massacred and the rest tried to flee over Mt. Sjemec towards Sarajevo. Working with Kusturica and Dodik will bring more damage to La Fenice Theatre and Italy and any good. Instead it would be a good idea if representatives of the La Fenice Theatre along with the Visegrad Municipality representatives would visit Straziste cemetery and pay respect to the genocide victims buried there.